It’s no secret OnePlus is working on a 5G phone, the company confirmed so at MWC. However we have very little information apart from its Snapdragon 855 chipset and X50 modem giving it 5G capabilities. 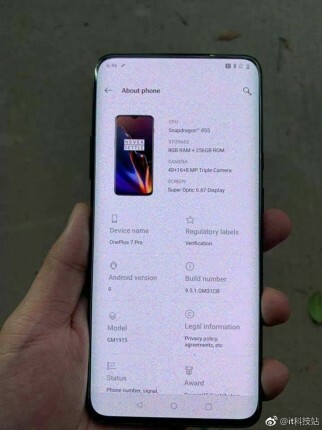 Today, two photos of the alleged 5G OnePlus phone popped up on Weibo revealing some key specs and its curved screen design with minimal bezels. The source calls the phone the OnePlus 7 Pro and bears the GM1915 model name. The about section in one of the images reveals the device is packing a 6.67″ Super Optic display, Snapdragon 855 with 8GB RAM and 256GB storage. The cameras have 48MP, 16MP, and 8MP sensors. The phone is running Android 9 with a 9.5.1 GM31CB build number. Said section oshows an image of the OnePlus 6T, which raises questions about the legitimacy of the post but it could also be unfinished software. Last month, a OnePlus phone bearing the same GM1915 model number and 9.5.1 software build passed Bluetooth certification, confirming its Bluetooth 5.0 support. More interestingly, the new phone’s model number strays away from previous OnePlus numbering strategy, which always starts with the letter “A” dating back to the OnePlus One. The altered model numbering could suggest the device will indeed start a new phone lineup and previously the company confirmed its first 5G phone will do exactly that.